At an early age, Virginia decided she would either be an actress, an author or an artist. She was born on July 31, 1902, in New Britain, Connecticut, the daughter of Walter H Hart and Louise Chamberlain. She graduated from Smith College in 1925 and enrolled in Hartford Art School where she studied oil and water color painting with Albertus Jones. Ginnie often visited her cousin, Martha Moore, who was studying art in New York City. Together they attended many parties in Long Island where Ginnie met her husband to be, Sanford B.D. Low. Ginnie painted her entire life. She painted with Sandy on their honeymoon in France and Italy, where – because Sandy won the ship’s pool – they acquired a leather bodied Alfa Romeo race car to carry their paint boxes. She painted scenes – often with her husband – all over the vineyard. One of their favorite painting places was the Oak Bluffs Campground. On one of their Campground excursions in 1938, they discovered that a cottage was for sale. They purchased it and moved it to Harthaven, where it is now the summer home of their son, Sam Low. 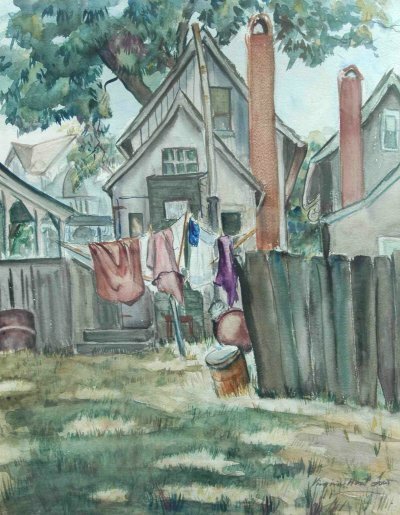 Ginnie exhibited at the Connecticut Watercolor and Gouache Show at the Wadsworth Athenaeum in 1939, at the New Britain Art League and the Old Sculpin Gallery, among other venues. She served as a director of the New Britain Museum of American Art and helped build the museum’s illustration collection as part of the Sanford Low Memorial Collection of American Illustrators.